Welcome to my Book Club Picks series. 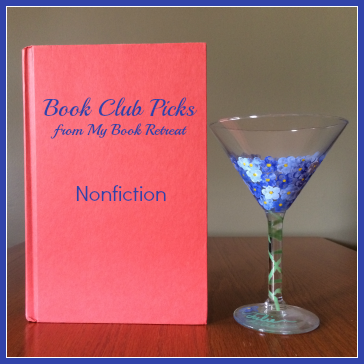 This week, I'm sharing some of my favorite nonfiction books for book clubs. Included are memoirs, biographies and general nonfiction books that would be great for book clubs to discuss. My book club doesn't read a lot of nonfiction, but we have read a few on this list, and the discussions went very well. We learned a lot about the topic or the subject of the book, and our eyes were opened to situations faced by others. This memoir reads more like fiction, or at least the reader wishes it were fiction. The situations and experiences that Walls and her siblings lived through, and the fact that they survived, will provide book clubs with plenty of discussion material. Topics of neglect, abuse, perseverance and so much more can be covered with this one woman's life story. Religion is a touchy topic that many book clubs try to avoid, but this book, written by three women in the aftermath of 9/11, can work as a book club selection. The authors share their personal stories about their quest to understand one another, while also sharing many facts about their religions that others may not know. Book clubs that are willing to delve into a topic that is often taboo will find a great deal to talk about and share with one another. This nonfiction selection reads like a biography of Henrietta Lacks, a memoir of Rebecca Skloot and a general nonfiction book about HeLa cells! It's an amazing story of the cells that were taken from Henrietta in the 1950's and are still used by scientists today. Book clubs can talk about the science, which is fascinating, but there is even more to talk about when it comes to Henrietta and her family. This memoir is written by a scientist about her own personal experience with having a stroke and subsequently recovering from it. Book clubs that enjoy nonfiction, particularly about science and medicine, will especially enjoy this one. The description of her stroke is fascinating, but the details about how she felt and what she really needed during her recovery will also give book clubs the chance to talk about the things they've learned and how it may help if loved ones become ill. This book about memory is pretty amazing. Book clubs will spend plenty of time talking about memory and the ways in which this book helped them understand it more and improve their own ability to remember things. I read this book in 2011 and some of the things Foer covered have stayed with me since then. What are your favorite nonfiction books? Do you have any that you'd recommend for book clubs to discuss? Don't miss out on another edition of Book Club Picks. Subscribe to my newsletter. Same with my book groups - we usually read fiction but (almost) always have great discussions when we venture into nonfiction. We read Glass Castle and Henrietta Lacks and enjoyed them both. We also really enjoyed The Big Burn and River of Doubt - both fascinating and riveting. I'll have to check into those two. I think next time I host, I'll put some nonfiction on the list to choose from. We haven't read nonfiction in a while.